Warm your home and grace your holidays with the spirit of Christmas with this collection of exquisite solo piano arrangements from Jeanne Cotter. 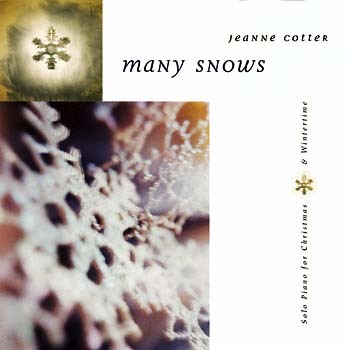 Dedicated to her brother Richard who died in 1992, Jeanne Cotter's Many Snows honors a season filled with hope and longing. This solo piano collection for Christmas and wintertime elegantly expresses the range and depth of emotion associated with the season. Featuring beautiful new arrangements of such classics as “O Come, O Come Emmanuel” and “What Child Is This,” Many Snows also includes a few newly composed songs for the season from Jeanne herself. Whether you’re in search of music to serve as the background for your personal prayer time or a holiday meal with friends and family, Jeanne's elegant piano music will warm your home and grace your holidays with the spirit of Christmas.